We offer beautiful options to help your home look its best. 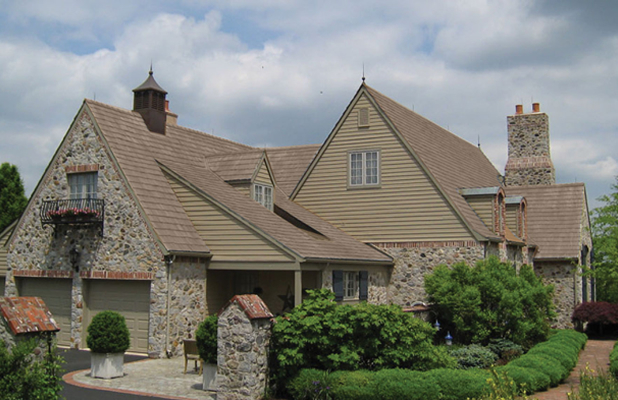 In addition to offering great service, The Cedar Roof Company carries a variety of products to compliment every home’s style and its owner’s needs. From milled cedar shingles and handsplit cedar shakes to no-maintenance Enviroshake composite roofing with the look of natural cedar, there is sure to be a roofing product to meet your needs. Cedar is a historically accurate material for period homes and so The Cedar Roof Company often works with architects designing custom homes and builders performing historical restoration. Enviroshake composite cedar roofing has also been used for several prominent historical preservation projects and may help earn LEED Certification points. We also offer several options for gutter installation and three color choices to select for cedar roof preservation services. Beautiful, durable and sustainable, cedar is the natural choice. Cedar is a beautiful and durable roofing material which can add value to a home with its many benefits including its sustainable design. It is a classic material employed in the construction of some of the country’s oldest and most elegant communities, but there are also practical reasons for its use. Cedar is naturally rot resistant, sustainably harvested, completely renewable and biodegradable. Western red cedar, from the very large and long-lived Thuja plicata, is a native to the Pacific Northwest. The soft red-brown timber has a tight, straight grain and few knots. The wood is also lightweight, impact resistant and offers a high R-value, a measure of insulation. All these attributes make it an ideal roofing material for a variety of climate. Every building product we use comes from a natural resource. Among all the building materials available in the U.S. today, however, only wood products come from a renewable resource – North America’s forests. Steel, aluminum, plastic and concrete are frequently thought of as wood substitutes, and it is often assumed that using these products will help protect our forests. But we cannot grow more iron ore to make steel, bauxite to make aluminum, petroleum to make plastic, or limestone to make concrete. These materials are mined or extracted from the Earth, never to be replaced. Even recycled wood substitutes contain large percentages of virgin, nonrenewable materials. Every time we use a product that comes from a nonrenewable resource, we are diminishing the Earth’s ability to sustain us. Wood roofing and siding, however, is make from a resource that can be planted, harvested and planted again and again. Wood is the choice for a sustainable future. Wood is biodegradable. When wood is no longer usable, it can be readily absorbed back into the Earth with no environmental harm. Wood fibers turn into non-toxic dirt and enrich the soil as they decompose. On a building site, wood scrap can be chipped and composted immediately with no hauling and no landfilling. Wood substitutes, on the other hand, are not biodegradable. Materials such as concrete rubble are very difficult to recycle or dispose of; steel and aluminum require massive amount of energy to recycle. Plastics are burdened with toxic substances that make recycling hazardous and costly. Also, plastic is not biodegradable and will remain in a landfill for centuries. Wood waste is not a serious problem in the U.S. and accounts for only 7% of landfill space by volume. Old wood roofing and siding can be easily disposed of without worrying about toxic chemicals leaching into our drinking water and poisoning the Earth. Wood is the more sustainable design choice for a roof. Wood is the choice for safe disposal. Emissions from gas and oil used in the production of steel have increased dramatically since the 1950’s and have contributed significantly to acid rain, which sterilized our lakes and rivers, killing our trees and wildlife. Aluminum production results in 8 times the air emissions and 300 times the water consumption as lumber production. Concrete production is estimated to emit almost 3 times more carbon dioxide, carbon monoxide and hydrocarbons, and produces 5 times more solid waste than the production of lumber. In contrast, wood does what wood substitutes cannot do. While trees grow, they absorb carbon dioxide, cleaning the air we breathe. Wood is the choice for cleaner air. Manufacture: According to the National Academy of Sciences CORRIM report, high amounts of energy are required to manufacture and transport wood substitutes. For example, steel studs take 9 times as much energy as wood studs, aluminum siding uses over 5 times the energy as wood siding, and a 4” concrete slab floor requires nearly 21 times the energy of a wood floor. In addition, the energy required to grow our timber supply is free. It comes from the sun. Use: The cellular structure of Western Red Cedar retards the passage of heat and cold with each cell acting as an insulating agent. According to the USDA Forest Service, wood roofing and siding has the highest insulation value of any of the wood substitutes. Wood has 413 times the thermal resistivity (R-value) of steel, 2000 times that of aluminum and 8 time that of concrete. Consequently, wood roofing and siding helps reduce the amount of energy needed to heat and cool our homes and offices. The world’s energy supply is dwindling. We must all, therefore, use products that consume less energy in their manufacture and help to conserve energy when used. Wood is the choice for saving energy. Every building product we use, including wood, steel, aluminum, plastic and concrete, comes from a natural resource. The Cedar Shake and Shingle Bureau would like you to consider that out of all these products, wood is incredibly strong, extremely durable, the most energy conserving and the only material that is 100% reusable, recyclable and biodegradable. The best wood comes from Waldun. 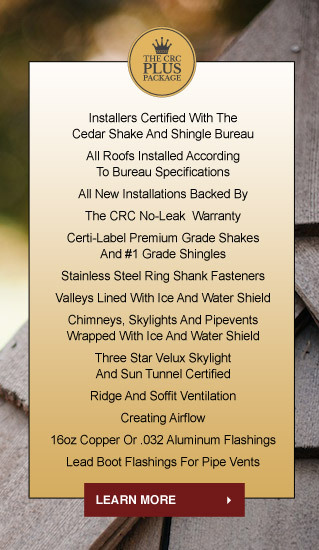 The Cedar Roof Company has chosen The Waldun Group as it’s supplier of cedar shakes and shingles because it maintains the most stringent quality-control standards in the industry. Waldun begins with high-quality western red cedar trees harvested on Vancouver Island. It purchases only mature, straight trees for its premium cedar shakes and cedar shingles. Each log is sorted for various product requirements before even entering the mill, and again when it is split to reveal its grain when it is determined if it will be a hand split or a sawn product. Skilled workmen then trim and sort each piece to the appropriate thickness and grade. Waldun’s premium grade cedar shakes offer 100 percent edge grain, which prevents warping and splitting as the wood dries. No. 1 cedar shingles, such as Royals and Perfections are also 100 percent edge grain. Waldun separates its cedar shakes and cedar shingles by grain and actually counts the number of pieces that go into each bundle to ensure that what you pay for is what you get. The mill schedules three quality-control employees to supervise each of its shifts and uses the strictest third-party grading agency available to certify that its products meet the requirements of the Cedar Shake and Shingle Bureau endorsement. Every Waldun product is 100 percent guaranteed to be on-grade or better. Three warranties that provide you three layers of protection. 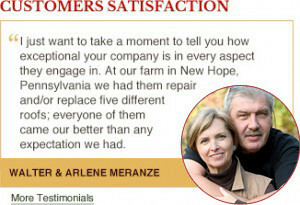 Based in Malvern, Pennsylvania, The Cedar Roof Company provides cedar wood roof installation, repair, maintenance, cleaning and roof certification throughout Chester County and beyond, including Wayne, Norristown, Delaware Valley, and Newtown Square, PA. For information and a free estimate, call us today at: (610) 647-3099.